Fruity Chronic Juice unites two strains that are renowned in cannabis circles around the world. We’ve managed to fuse the productive qualities of Chronic with the aroma and resin production of the original White Widow. Although it’s an indica with a compact structure that’s ideal for indoors, it can get very tall if given enough room for the roots to develop, making it a perfect candidate also for outdoor growing. It produces large branches that rapidly fill with flowers. The buds are conical shaped and very compact. 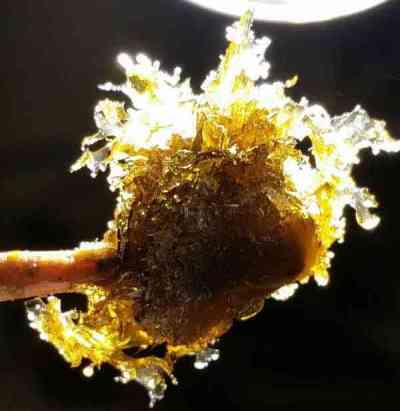 Fruity Chronic Juice produced a large quantity of resin. The buds look as if they’ve been coated with a layer of sugar. To fully enjoy the taste of this strain, it should be harvested at just the right moment. It smells and tastes of very sweet citrus fruits like oranges or grapefruit. Some growers also detect an aftertaste of very aromatic hash or pine. This is a strain with a very wide range of flavours. If this were a wine, we would describe it as having one of the finest bouquets in the world. The effect is very potent with a nice balance between physical and cerebral. The initial effect is very rapid and lasts for some time. With high levels of THC and CBD, this is a strain that’s suitable for any type of usage, whether medicinal or recreational.